The Wet Tropics of Queensland is an area mainly consisting of wet tropical rainforest with a great variety in animal and plant species. Its area extends along the north-east coast of Queensland for a distance of ca. 45Okm. It comprises 41 national parks and dozens of other forests and reserves, including Barron Gorge National Park, Cedar Bay National Park, Daintree National Park, Girringun National Park and Wooroonooran National Park. I visited this WHS in January 2018. 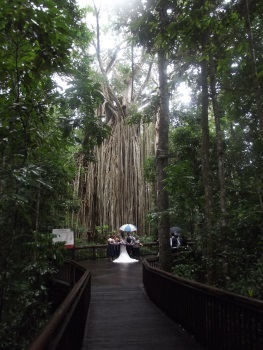 Having already visited a number of rainforests, we decided to visit this WHS as an easy day trip from Cairns. After arriving at the Skyrail Rainforest Cableway Terminal in Smithfield, the whole cable car ride (7.5km) over the rainforest canopy took around 40 minutes (not including time spent at each station). There are 2 worthwhile stops: Red Peak Station and Barron Falls Station. Red Peak Station is the highest point at 545 metres above sea level and there is a 200 metre boardwalk where you can easily see primitive fern-like cycads, elkhorns, staghorns, bird's nest ferns, Kauri pines, Alexandra palms, Caribbean pine trees, fan palm trees, a variegated fig and a banyan tree, apart from several metallic starlings. The next stop is Barron Falls Station surrounded by lush, complex rainforest with several basket ferns and Cooper's tree ferns. The best views of the Barron Gorge and Falls from the cable car are between Towers 25 and 27. When we stopped at the Barron Falls Station, we headed straight to the small yet informative Rainforest Interpretation Centre and then to the three lookouts providing panoramic views of the Barron Gorge and Falls. There are UNESCO WHS inscription boards at both stations as well as other information boards on the flora and fauna. We happened to visit on one of the few days when the Wet Tropics of Queensland didn't live up to its name as it was a hot sunny day. Probably this was the reason why there were so many different species of colourful butterflies (and cicadas) hovering around. 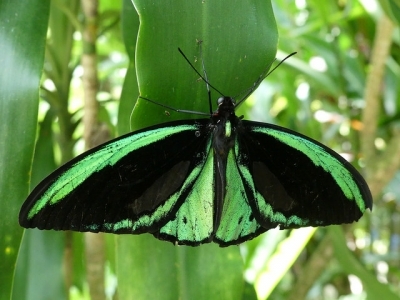 The highlight of our visit was spotting Australia's largest endemic butterfly, the Cairns birdwing (photo). We also spotted some new bird species such as the Torresian imperial pigeon, the Eastern whipbird, the Chowchilla and the common rainbow lorikeets. The Wet Tropics of Queensland are believed to be the most diverse rainforests in Australia. Different soil types, altitudes, rainfall and evolutionary histories have produced many different plant communities and habitats, even though to the ''untrained eye'' most rainforests seem pretty similar. The Barron Gorge Hydro-Electrical Station controls the flow of water to the falls so don't expect to see huge falls (apart from once or twice a year when they flush the water system!). The Skyrail Cable Car ends at Kuranda, a small touristy village in the rainforest. I suggest taking the shuttle service up to the village itself (on the way back down to the Kuranda Railway Station, you will still be able to pass by the numerous shops and stalls selling souvenirs if you want to). Apart from the circuit walk to Kuranda, there's also a pleasant river and 'jungle' walk to Jumrum Creek (3km). At 14:30 we also went for a short cruise on the Kuranda River Boat which conveniently returns in time for the 15:30 train. Apart from a few turtles and common bird species you won't see anything you won't see near Cairns, so in my opinion the trip is not worth the 18 dollar fee. For our return trip to Cairns we had booked a Gold Class seat on the old-looking yet comfortable cabin of the Kuranda Scenic Railway. We really enjoyed our relaxing trip back to Cairns being served cold drinks from the 'open bar' and finger food. Including stops at Barron Falls and Stoney Creek Falls, the trip took around 90 minutes. The Cairns-Kuranda Railway was constructed between 1882 and 1891 and even today is considered an engineering feat. Hundreds of men were employed to build the 15 hand-made tunnels and 37 bridges. All in all, we enjoyed this easy day trip from Cairns even though we preferred our visits to the Gondwana Rainforests and the Blue Mountains. Lush, green rainforests carpet the low hills of the Wet Tropics of Queensland, which border the beaches, coastal towns, and agricultural fields of the northeast coast of Australia. When I visited the Great Barrier Reef in June 2012, my friend and I chose to visit the hill town of Kuranda, using the Skyrail Rainforest Cableway, which transits through the World Heritage Site. The gondola ride provided an incredible view of the Atherton Tablelands and Barron Gorge National Park, as well as two sightseeing stops along the way. The first stop featured a museum and a walk through the canopy, overlooking ferns and tropical hardwoods; there were also displays about local fauna, though I never did find a cassowary. The second stop included an overlook of Barron Falls, which was not particularly impressive in the dry season. Kuranda town itself was rather charming, with a couple nice nature walks from town into the rainforest. On the way back to Cairns, my friend and I opted to take the Kuranda Scenic Railway, which gives a closer look at the rainforest. I highly enjoyed the brief visit to the wet tropics, and if I return one day, I'll have to rent a car to drive to Daintree National Park to see the mangroves and crocodiles. Logistics: The Wet Tropics of Queensland can be easily combined with a visit to the Great Barrier Reef. 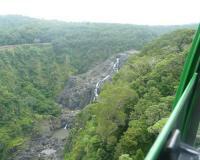 The Skyrail and scenic railway to Kuranda are both near Cairns, and can be reached by private transportation. This year I traveled to revisit Kuranda by the slow train, a journey that allows plenty of opportunity of seeing the rainforest close up, and vistas of the Coral Sea in the distance. Kuranda village however remained unchanged from the way it was when I last visited 25 years ago. a. The Daintree River with its ovrhanging foliage, abundant birdlife and the occasional crocodile. 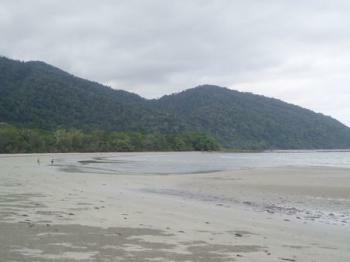 b. Cape Tribulation Beach, where the rainforest meets the reef. c. a cruise on Lake Barrine opened up a world of tall trees, fish, eels, snakes and turtles all living in and around its waters. d. The Curtain Fig Tree near Yungaburra with its aerial root system high up in the foliage. This is was the first time I consciously visited a WHS site. I had never really thought about the concept of WHS, but walking around in the forest at Kuranda in 2006 I saw a sign indicating that this was the wet tropics and a WHS, and suddenly I felt that I was at a special place right now, that this was something extraordinary. Today, the wet tropics are still one of my favourite WHS. I have visited different places of this WHS several times, as I have lived in the area for a few months and I will certainly return again and again. I just love the rainforest! There are several places accessible to tourists, not only the famous Kuranda with the sky rail and the train, but also Daintree National Park where you can do great bush walks and Cape Tribulation. 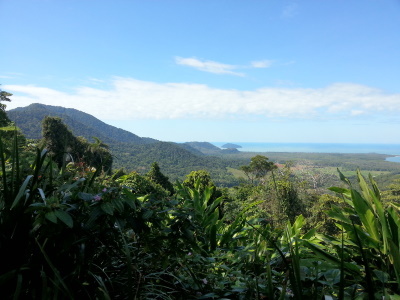 Where the reef meets the rainforest - at Cape Tribulation you can really see it. My favourite place, though, is Wooroonooran National Park with its tree top walk. The views are spectacular. There are guided tours available to all of these places. No matter where exactly you go - Far North Queensland is spectacular and beautiful, not only because of the wonderful rainforest, but also because of the laid-back atmosphere, the friendly people, the great weather. I left a part of my heart there and wait for the day I can go back! With a day to spare in Cairns it was a toss up between a trip out to the Barrier Reef or to the Wet Tropics. The latter WHS was the one I felt I had seen less well on a previous trip so we booked ourselves a return trip to Kuranda – out by the Skyrail Cableway and back by the Scenic Railway. The ticket was an eye watering 101 AUD (c80 Euro) – by doing the trip as 2 singles on each mode of transport we lost the benefits of return ticket prices which would have reduced the cost a bit – but not by much! Unfortunately the “Wet Tropics” were living up to their name as we took the cableway from its starting point a few kms north of Cairns. I can’t say I found the trip that worthwhile – ok it was going over (and at times as we climbed – among) the trees and one could make out different species and see the epiphytes and a few birds but I am not sure that all that technology really enabled one to gain a better feel for the “forest”. The cars moved at a fair speed but there were 2 stopping points to change cars which also had walkways to enable one to “experience” the forest from below. The walkways were exceedingly short. At the first stop there was a park ranger who led a “guided walk”. I am still a bit surprised at how poorly this was done. He didn’t know our nationality within the group of mainly other nationality tourists and Aussies but the commentary consisted largely of anti British jokes and asides – mostly totally irrelevant to the subject (viz Prince Charles’s sexual habits!). It wasn’t just our attention he lost. Now I am not a “nationalistic” person and don’t really care what is said about us but the whole impression given was unprofessional. The Queensland Government really ought to exercise better quality control over its rangers! The second stopping point provided a good view over the Barron Falls (photo from the cable car) but, despite all the rain, very little water was going over them as most of it is diverted for the hydro power station and we had to make do with a large picture of what they look like on the few days a year when the water is diverted back into its natural course to “flush” the system! There were also a few signs about the wildlife – including a picture of a Cassowary but they wisely stayed well away so we went into the Interpetation Centre and listened to its recordings of forest birds! Kuranda was a pleasant enough little town set among the greenery. Today its main raison d’etre seems to be as a tourist shopping centre. We escaped without a single knick knack but had some interesting conversations with members of the local Djabugay people. The train ride back was perhaps the highlight of the trip. The railway’s construction in the 1880s was an engineering feat. 37kms long in total from Cairns, it climbs 328 metres in perhaps 20 kms with numerous tunnels and bridges. The carriages are designed to look “antique” but have modern LCD information screens and speaker systems, large windows and easy access to both sides. The locomotion is provided by modern twin diesels – painted with a Djabugay representation “of Buda-dji, the ancestral being, who, in the shape of a giant carpet snake, formed the Barron Gorge”! The trip takes around 1 hr 45 minutes with a scenic stop at the Barron Falls and another at Freshwater on the plain a few miles outside Cairns for “transit” passengers. For about 2/3rds of it there are fine views down into the gorge and up to the waterfalls above. At one point the train does a semi circle across a spindly trestle bridge providing a photo of the entire train if you are in a rear carriage. So, if you want a day out with a couple of “gee whiz” rides then do as we did. However, if you really want to explore the Wet Tropics forest for its natural aspects you would be far better advised to arrange a walk – there are a number of trails in the Barron Gorge Park which start only a few miles outside Cairns. I reside in Carwell Queensland Australia. As of the 20th July 2006 road access from Cardwell to the hinterland World Heritage Wet Tropics has been closed. More than 30 years ago Queensland State Government sponsored logging operations ceased in the Cardwell Ranges. The key Cardwell Shire Council infrastructure which assisted logging operations is known as the Kirrama State Forest Road; currently in a state of decline, neglect, and disrepair. If you would like access to Australia's Cardwell Range "Wet Tropics World Heritage " please E-mail the Cassowary Coast Regional Council. A collection of national parks and nature reserves in northeastern Queensland, the Wet Tropics area protects the only rainforest in a first-world country. Some parts of the site are easily accessible from places like Cairns, Cooktown, or Townsville, and the easiest trip (probably the easiest way to see a rainforest in the world) is to make the train ride from Cairns to Kuranda through the spectacular wilderness of Barron Gorge National Park. Kuranda is a charming little jungle town with many attractions, the major one being the way you should get back to the coast - by way of Skyrail, a cableway that lets you see the rain forest from above. Probably a bit questionable from an environmental point of view, but still an unbeatable experience. 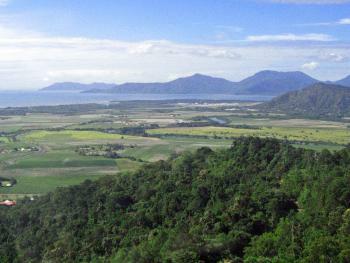 I suppose it's not such a bad thing that most visitors see only this area, leaving the rest of the Wet Tropics alone. Lazarus species: Mahogany glider: described in 1883 and not recorded between 1886 and 1973. An expedition by theQueensland Museum in 1989 found a living population. Sugar: Deforestation for sugar plantations has had a significant negative role in defining the areas of inscribed remnant rainforest.